You don't want to miss any fun, like Patrick Kane's hat trick. 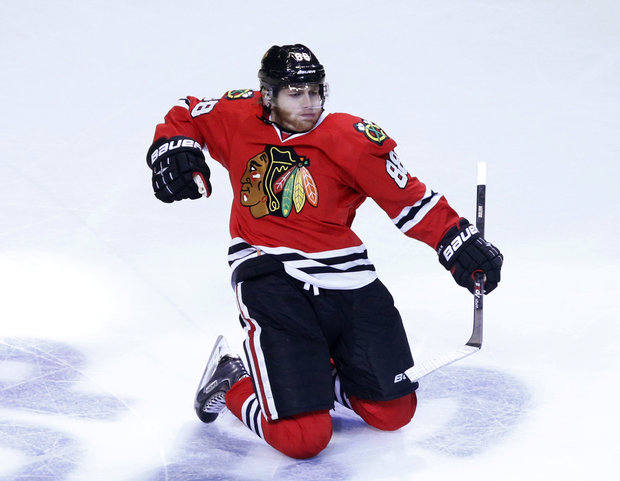 Patrick Kane's hat trick is part of the fun of the Blackhawks. Being late to the party is just fine. But it&apos;s time to give your full attention to the Stanley Cup Finals as Chicago takes on the Boston Bruins. Everyone who knows a little bit about hockey knows that this is a very special pairing of teams from the “Original Six”. For decades Chicago, Boston, Detroit, Montreal, Toronto and New York (Rangers) were the whole league. After the expansion in 1967, the NHL added more teams and diminished the spotlight on these six clubs. These teams do not have many meetings during the regular season. And not since 1979&apos;s Rangers vs. Canadians match up have two of the original teams met in a Stanley Cup Final. That are good reasons this is a special match-up it is a way for history to be told and for history to be made. That is the way with most sports leagues-we know how much it means in Chicago when the Bears met the Packers. It is not just the proximity of the teams, it is big city versus small town USA- it is the history of these original NFL teams. The NHL’s lockout stumbled into a compelling storyline: since the league only had 48 regular season games, it scheduled only games within the Eastern and Western Conferences. That makes this Final intriguing because the teams haven&apos;t faced off yet this season. Blackhawks Coach Joel Quenneville admitted he has watched all the Bruins playoff games. Talking to the Hawks after Saturday’s thrilling 4-3 double overtime win, questions about Boston came up. Andrew Shaw spoke about the physical nature of the East coast team, but he hasn’t experienced it yet. He talked with fresh bruises and cuts on his face from the Los Angeles Kings. He will definitely feel the brawn of his opponents in this round. Just a few months ago, the Boston Marathon bombing affected that city and the rest of the country. When that horrible incident happened it tore at the heart of that city, but it didn’t diminish the resolve of Boston. The sports teams in that city, including the Boston Bruins, galvanized the strength and resolve of the Bostonians. So this championship series will likely spotlight the aftermath of that tragedy. Sports have a way of re-kindling the spirit of fans and you can expect that will happen in Boston. There is a quote that former White Sox manager Ozzie Guillen used, “Winning is fun and fun is winning.” Even if you are not a hockey fan, or don’t know anything about the blue line or high sticking, you can revel in the fun and just join in. That is what these past few weeks have been with the Blackhawks. Watching Bryan Bickell breakout in the playoffs, Corey Crawford mature into an excellent goalie and Patrick Kane score the third goal of his hat trick in double overtime-that is fun! Grip the railing and enjoy the ride: there may be another Stanley Cup for Chicago when it ends.